Please note that what is written below are ideas put forward by scientists, and some have not yet been proven. Many biologists believe that the wolf we know today originated from a primitive carnivore species known as Miacids. The Miacids ranged from being gopher-sized to dog-sized and appeared in the Tertiary Period about fifty-two million years ago. Some people believe that the Miacids are the most likely ancestors of the Canidae, though no one is certain. It is thought that Grey Wolves would have originated in Asia and most likely took up residence in North America around 700,000 years ago, after crossing the land that was still joined together during this period. Wolves from that period have undergone a series of rapid evolutionary changes to become the Wolf we know and love today. Similar species to the Grey Wolf. While at RoW we only allow the subspecies of the Grey Wolf (Canis lupus) to be played, scientists have found that there are other species of wolf that are genetically distinct from the Grey Wolf, such as the Himalayan wolf (Canis himalayensis). However, also classed under the Canis genus are species such as the Coyote (Canis latrans) and the Simien jackal (Canis simensis) which, while having similar characteristics to the wolf, are genetically and phenotypically different, such as being much smaller. Subspecies of the Grey Wolf. At Relic Lore we only allow extant species of wolf to be played, meaning that if a subspecies has been classed extinct you will not see it in Relic Lore. Only subspecies of the Grey Wolf that could reasonably exist and survive in Canada are allowed to be played here, as this is the species native to the area Relic Lore is set. Mixed species like wolf/coyotes and wolf/dogs will not be allowed to join the game. Below are some of the more common subspecies that are played at RoW. Arctic wolf (Canis lupus arctos). Arctic wolves generally have white fur, though it can vary slightly to include darker shades of grey. They fur is also long and thick to keep them warm in the extremely cold temperatures they are used too. To help prevent a loss of body heat they have rounder ears and shorter legs and muzzles than other subspecies. Arctic wolves are not fast runners and rely on their stamina more than speed, they are typically a smaller subspecies due to the extreme subzero conditions they face. Eastern Timber wolf (Canis lupus lycaon). The Eastern Timber Wolf is a small-medium subspecies and tends to be of a slender build, so that at times it can resemble a Coyote. This subspecies has a lot of diversity in their colouration and can be found with white, black, red, grey and brown hues, though a tawny colour tends to be the most predominant hues with reddish hints throughout it. Like most wolves their fur thickens in the winter and then sheds into a thinner coat during the summer, tending to lighten when doing so. Great Plains wolf (Canis lupus nubilus). Considered a typically "average-sized" wolf they tend to fall into the medium-large range physique. Their coat shows great variation as you can find black, brown, grey and white individuals, however a browny-grey colouration tends to be the most common with buff, tawny and red highlights. While they are fairly tall and long they tend to remain quite lithe and slender so are more compact than the Mackenzie Valley subspecies, and therefore tend to be smaller and quicker. Mackenzie Valley wolf (Canis lupus occidentalis). As one of the largest subspecies of Grey Wolf it tends to be a tall, long and sturdy wolf which relies on it's strength and stamina more than speed. This wolf's thick, long limbs are designed to transverse through rough terrain like thick snow or mountain ranges, it's powerful shoulders are key to it's strength in bringing down large prey. The Valley wolf has a broad range of colouration allowing wolves to be found with shades of brown, black, grey and reddish hues. Appearance guidelines of the Grey Wolf. Before you decide your character's appearance too seriously it is important to make sure it matches the specifications of your chosen subspecies. For example, you could not create a black wolf and then select its subspecies as an Arctic, or likewise a Mackenzie Valley Wolf with a small physique. A wolf's appearance varies between their species so deciding what species your wolf will be should be your first step. A key aspect of picking your characters appearance is their fur colouration. RoW is a realistic wolf rpg, meaning that we only allow fur colours that would naturally occur in the wild and those that can be found with your wolf's subspecies. Below is a colour chart that you can use as a guide to help decide on the range of hues you could design your wolf to be. In the wild wolves are almost exclusively found with either yellow, orange or brown hued eyes as these are the best at reflecting light. When cubs are first born they have blue eyes but these colours are lost when their eyes mature and turn into one of the most common eye colours. Very rarely wolves can be found with blue eyes in adulthood but it is likely their eyes were never fully matured and thus are likely to be weakened. One of the profile fields for your character's page in RoW is 'physique' where you can either pick large, medium or small relating to adult wolves and yearlings, or cub, to represent a character under the age of one. Like fur colour, which physique your wolf can be is reliant upon which species you select for them. 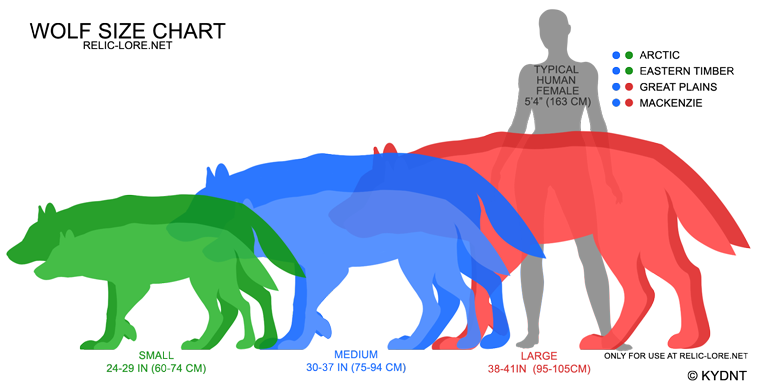 Below is a guideline of the sizes of each physique and the species that can be in them. Please note how different physiques affect your life points.